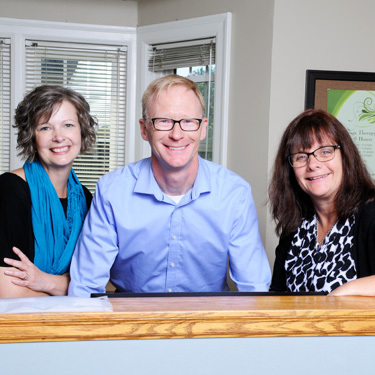 The Alliston Chiropractic Wellness Centre team is friendly, compassionate and understands your need for effective health care. Our dream team will bend over backward to meet your needs! Melissa is a certified doula trainer. Melissa has a heart of gold for helping people and this quality shines through in both the doula realm as well as working with people seeking chiropractic health care. Melissa and her husband, Chris, have raised six homeschooled kids. They love walking their golden retrievers in the forest when it’s not too buggy and have been geocaching all over the world, sometimes with the kids and sometimes with the dogs. Marlene and her family have made Alliston their home for the past five years after returning to Canada from South Carolina. While there, Marlene worked as a Nursing Assistant and a unit secretary in Maternal and Newborn Care. Today you can find Marlene here at the office, being creative with flowers at Berns or at home baking cinnamon buns. Tara is well known in our community for both her skill as a massage therapist and as a former Coach with the gymnastics club. Tara’s love for travel has taken her all over the globe and she has experienced many adventures both here and abroad. Ask her about it next time you see her! Our amazing caring team is ready to answer any questions you might have. Contact our office today!